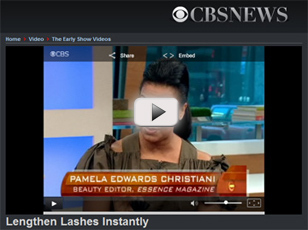 Xtreme Lashes featured by CBS TV's The Early Show. Essence Magazine's Beauty Editor, Pamela Edwards, selected Xtreme Lashes as her preferred brand of eyelash extension for its safety and dramatic results. Xtreme Lashes® Artistic Director and Master Lash Stylist, Noor Daoudi, applies Xtreme Lashes® Eyelash Extensions on CBS TV's hit show The Doctors. ABC 15's Sonoran Living in Arizona talks with Certified Lash Stylist Sherene Treat of It Girl Diva in Scottsdale, AZ about Xtreme Lashes. CLTV's Metromix takes time out to try Xtreme Lashes® with Certified Educator and Advanced Lash Stylist Ignacia Garcia at Flutter Lash Studio in Chicago, IL. "If the eye is the window to the soul then window treatments are the hottest spring fashion." CBS 11 News Dallas takes a look at the lengths women are going to for longer lashes with Xtreme Lashes® Certified Professional Lash Stylist Anne Pham at The Lash Couture in Frisco, TX. 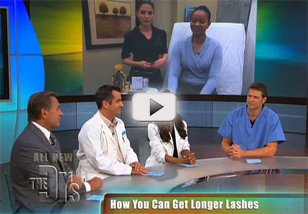 The Daily Buzz, from The CW in Madison, features Xtreme Lashes® on its morning news program. Host Emmy Fink spent time with Advanced Certified Lash Stylist Amy Dickerson, of Papilllion Beauty in Middleton, WI to find out about the procedure and get her own lashes extended. 19 Action News investigates Xtreme Lashes® for their consumer segment "Does It Work?" with Certified Professional Lash Stylist Dawn Tyree of Exclusive Eyelash Designs in Cleveland, OH. Their findings: "Xtreme Lashes DO work!" Celebrity Makeup artist Georgio shares his Red Carpet Tips for creating the perfect smoky eye, including the use of Xtreme Lashes eyelash extensions. The lashes featured in the video, created for Celebrity Wire TV, were styled by Advanced Certified Lash Stylist Mikaela Fernandez, of Ladylash Studios in Delray Beach, FL. American Woman, a CW/Comcast weekly series, puts a popular mascara, that claims to give the appearance of eyelash extensions, to the test against Xtreme Lashes®. Working on a volunteer test subject, Advanced Certified Lash Stylist Christy Malles of The Purple Flower in Denver, CO applied Xtreme Lashes® on one eye while the mascara in question was applied to the other eye. The model participating in the investigation selected Xtreme Lashes®, without hesitation. "They're so much prettier... I was thinking it was going to be pretty comparable, but not at all!" Belk Salon & Spa in Columbia, South Carolina. Celebrity Wire TV showcases an Xtreme Lashes® application by Advanced Certified Lash Stylist Mikaela Fernandez, of Ladylash Studios in Delray Beach, FL. The application was taped as part of a Celebrity Wire exclusive beach-front video shoot with European model Lucia. KHOU, 11 News Houston talks with Xtreme Lashes President Jo Mousselli about lashing the stars for the Latin Grammy Awards. The interview features an application of Xtreme Lashes by Houston area Certified Professional Lash Stylist Debbie Weeks of Tranquility Salon. If you would like to contact Debbie you may do so at 713.203.9333. DJ Ella, worldwide recording artist, proudly shows off her Xtreme Lashes in her latest video “Shine like a superstar”, where she is backed by stars of Latvia’s Women’s Olympic Basketball team, including standout Dita Krumberga (back row, center), another big fan of Xtreme Lashes®!. Xtreme Lashes LLC launches fashion designer Lizzi London in Houston, TX. 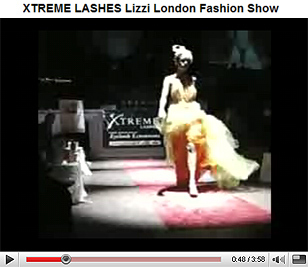 Xtreme Lashes extensions were donned by Lizzi’s models on the catwalk to reflect her flawless designs. (above) Interview with Jo Mousselli, President and Founder of Xtreme Lashes® at the 2008 Las Vegas Esthetics Show. Great Day Houston demonstrates how to “Lift Your Eyes” with Xtreme Lashes®. Certified Professional Lash Stylist Debbie Weeks of Tranquility Salon in Houston, TX and Xtreme Lashes® President Jo Mousselli discussed the benefits for audience members. If you would like to contact Debbie you may do so at 713.203.9333. After a red carpet event at the Cannes Film Festival, Xtreme Lashes President Jo Mousselli and Master Stylist Noor Daoudi attend the launch party for Bono and Petra Nemcova's "The Love Evolution" film. During the party, TV Presenter for Celebrity Wire TV, Hofit Golan, asks Jo and Noor about Xtreme Lashes and gushes about how much she loves the product. In her own words, "it's an amazing idea...you wake up and look fabulous." American Woman, a CW/Comcast weekly series, aired a special feature on Xtreme Lashes® by Certified Professional Lash Stylist Christy Malles of The Purple Flower in Denver, CO. Christy applied lashes on the show’s host, Nancy Fitzgerald, while discussing the benefits and techniques of an application. Macys’ Xtreme Lash® Stylist Jodi Wray demonstrates an application of Xtreme Lashes® on camera for KDKA Channel 2 in Pittsburgh. If you would like to contact Jodi you may reach her at the Elizabeth Arden Salon inside Macy’s in downtown Pittsburgh, PA.
Lauren Lee, winner of The Ultimate Coyote Ugly Search 3’s Episode 7 challenge, received an on camera makeover including, “…my personal favorite eyelash extensions,” said Lil Lovell, Coyote Ugly’s founder and the show’s host. Her Xtreme Lashes® were applied by Certified Professional Lash Stylist Christy Malles of The Purple Flower in Denver, CO. Lauren said, “That was the main thing that Lil could not stop staring at me about. She loved them, and so did I! Thank you so much!" (above) TNT Latin America highlights Xtreme Lashes® featuring Swarovski Crystals for the Red Carpet at the 2008 Academy Awards. (above) Certified Professional Linda Tical, of Goddess Spa on Wheels in Miami, Florida was featured on Miami’s Fox News 7 for her applications of colored Xtreme Lashes®. Linda applied colored lashes and sparkling Swarovski Crystals on several models shown throughout the footage. If you would like to contact Linda, please visit goddesslashes.com. (above) Xtreme Lashes® Certified Professional Brandy Manning, of B’s Wax & Lash in Denver, CO, discusses the importance of seeking out a Trained Professional for any eyelash extension application on Colorado’s Fox 31 News. The client featured in the story had poor quality lashes improperly applied by an untrained technician at a local salon before seeking out Brandy’s professional Xtreme Lashes® services. (above) Xtreme Lashes® Eye Makeup Remover and Xtreme Length Mascara featured on News 10 in Upstate New York during the filming of an application of Xtreme Lashes® by Lash Stylist Amanda Filli of Jean Paul Salon in Albany, NY. (above) Georgia Life & Style Television features Xtreme Lashes® as their Beauty Pick of the Week. (above)	“I love my new lashes,” exclaims Laura Rizk, WCIV ABC News’ Gadget Girl. Laura had Xtreme Lashes® applied by Lash Stylists at Bellezza Salon and Spa in Charleston, SC for her weekly product testing segment. (above) Xtreme Lashes® and Certified Professional Natalie Thompson of Halo Salon & Spa featured on St. Louis, Missouri's Majic 104.9. Natalie was filmed applying Xtreme Lashes® to Arika Parr, the producer of the ‘Tony Scott & The Breakfast Crew Show’. (above) Highlights from the 2007 Cannes Film Festival, featuring Xtreme Lashes®, aired on E! Television Italy. (above) Xtreme Lashes® featured by the UK's Fashion TV as part of the Cannes 2007 coverage. (above) Xtreme Lashes® featured by Germany’s Wir Lieben Kino as part of the 2007 Cannes Film Festival coverage. 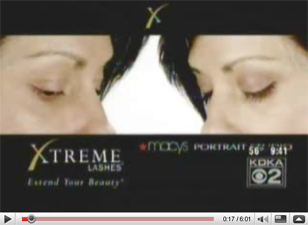 (above) TNT Latin America featured Xtreme Lashes® in a segment on Red Carpet Beauty for the 2007 Academy Awards. (above) Xtreme Lashes® featured on StarStyle.com. (above) Xtreme Lashes® and Certified Professional Veanessa Burbage of Affordable Enhancement in Littleton, CO, are featured by Denver’s ABC Channel 7 News as they delve into Xtreme Lashes® as "the secret of Hollywood's hottest starlets". (above) Xtreme Lashes® featured on WFAA ABC Channel 8 News, Dallas/Fort Worth. 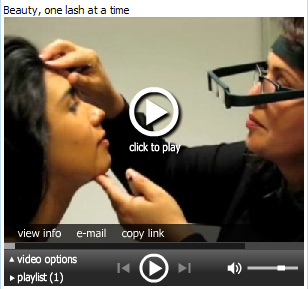 (above) National newsreel segment showcasing the benefits of Xtreme Lashes®. (above) Canal Plus (French TV) visits with Xtreme Lashes® at the Emmy's 2006 beauty lounge, where stars were busy extending their beauty®. 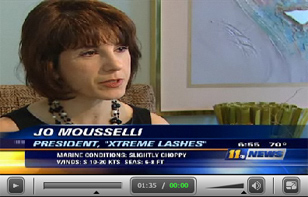 (above) The Beauty & Fashion Channel interviews Xtreme Lashes® President Jo Mousselli for being chosen as one of the Best New Products of 2006 by the International Beauty Show in New York. “Extreme Eyelashes” Mentioned on Good Morning America!!! Xtreme Lashes® is a global product that is even featured in Ireland on T.V.! Xtreme Lashes® Eyelash Extensions featured on KSBI-TV 52 Oklahoma.